Want a more spacious working table or study table? Then this pink table with open bench in bright pink color could be a good pick! 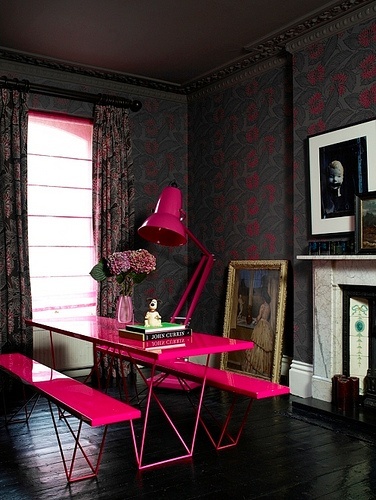 I love the coordinating floor lamp in the same shade of pink. Lovely! This could be great if you have 2 or more girls at home. I bet you would agree that studying in group is still the best option. Besides, as a Mom, you wouldn't get tired of delivering their snacks during study time in each girl's room. :) Also, having this study table positioned beside the windows would save you from utility bills as you can get natural light during day time.